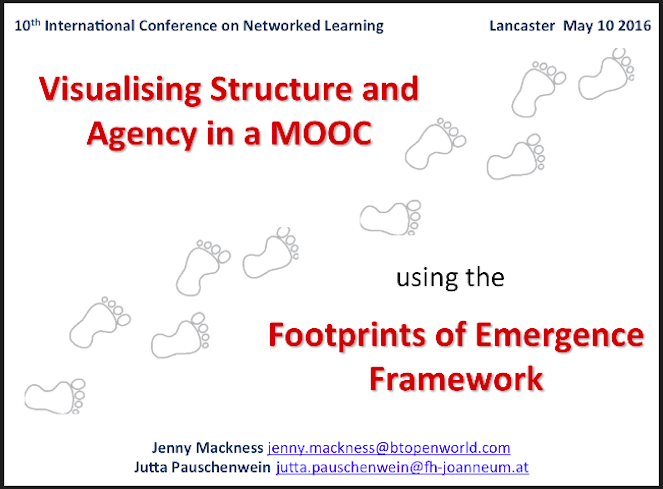 What are the appropriate roles for educators (in MOOCs)? 12 people engaged in this discussion. I will be referring to their ideas but not citing them in this post. If you want to check who said what then the discussion forum is open. Mike Sharples’ question referred to educators, but sometimes people were talking about educators, sometimes about teachers and the two words were often used interchangeably. The difference in meaning between these two words was not discussed, presumably because people didn’t think there was one or it wasn’t sufficiently important. Going through the forum posts it is clear that we didn’t come to any conclusions. It was recognised that MOOCs, with their massive numbers of learners have raised questions about who is the teacher in a MOOC, can anyone be a teacher, whose role is it to facilitate discourse, whose role is it to scaffold learning and so on. It was also recognised that in MOOCs the teacher/educator’s role is likely to be distributed, either through a team of teachers or between learners, and that there are multiple roles that a MOOC teacher/educator could adopt (See references to Downes below). The argument was made that in a MOOC the learning environment has been reshaped by technology and needs multiple educators. Interestingly I could cite any number of MOOCs in which there is just one educator (i.e. it has been designed and set up by just one person), and this doesn’t only apply to xMOOCs. If we agree that one person alone cannot effectively teach/educate large numbers of learners at the same time, then are we assuming that, in the absence of teaching team, we are relying on learners to educate/teach each other? This question of course led to a discussion about what is knowledge and who has it. What is the role of the teacher/educator in negotiated learning, social constructivism and situated learning? Are moderation and facilitation roles enough? A view was put forward that moderation is needed to monitor and manage abuse and facilitation is needed for orchestrating interactions, but what more does a MOOC educator need to do? What about knowledge and truth? 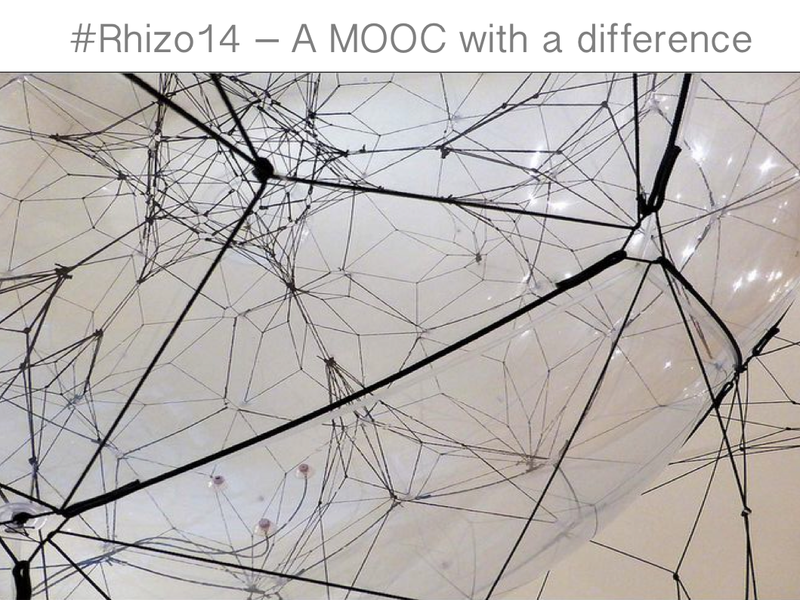 What is the teacher’s role in the construction of knowledge in MOOC learning? Is it the MOOC teacher’s role to be a conveyor of authoritative facts and knowledge? There was some discussion about authority and it was suggested that authority impacts negatively on learner autonomy, which in connectivism is a key characteristic of learning in MOOCs. The idea that a teacher is an authority was questioned (the reason given was that authority is imposed), but the teacher can (and should?) have expertise (expertise is not imposed, but recognised). The role of power and authority in the social construction of knowledge was acknowledged. Of course this discussion could apply to any teaching environment, not just MOOCs. I was left wondering whether separating authority from expertise is straightforward. We didn’t really get to grips with the question of whether the teacher is ‘redundant’ in a MOOC. Garrison, Anderson and Archer’s CoI framework (see reference list below) and the importance of ‘teacher presence’ was referenced but not discussed, I suspect because the thread was about roles of educators/teachers, rather than about who is the teacher in a MOOC. In reflecting on this forum discussion, I think that in focussing on roles, we never really got to grips with the question of who is the teacher in a MOOC and whether and why we still need teachers. It was suggested that teachers will never be erased from society but if that is true, what is it that teachers do (and here I mean trained teachers, or career teachers, as opposed to say parents as teachers), that others don’t or can’t do? I enjoyed the week’s discussions even though I don’t feel much further forward in understanding the teacher’s role in MOOCs. However, looking back through my notes I see that I wrote: ‘A teacher is more than a collection of roles. A teacher has an identity – it’s something about who the teacher is and how the teacher is perceived by learners, as well as what the teacher does – it’s something about the relationship between teacher and learner’. If teaching as a profession is not going to ‘disappear’ (see Biesta’s paper in the reference list) and MOOCs are not going to disappear, then future teachers (those being trained now) will have to understand not only the MOOC environment and the roles they might need to adopt within the MOOC environment, but also have a clear idea of who they are and what they stand for. I was once asked in an interview for a teaching post to explain my teaching philosophy, what I believe in and what I stand for as a teacher, but that was long before MOOCs. Is this a question that MOOC teacher/educators need to be able to answer? A number of references to literature were made in the forum which show how wide-ranging the discussion was (see below). Can Mill’s empirical account of arithmetic be defended against the criticisms of Frege?